by jeffrey schwartz | m.c.p. No one would mistake Broad Street for Magazine Street. We’re OK with that! While we love Magazine and all of our fellow retail corridors–after all, commercial corridors make up the backbones of our great neighborhoods–we are head over heals for Broad Street. Broad is a big, buzzing urban commercial district. Broad is broad! 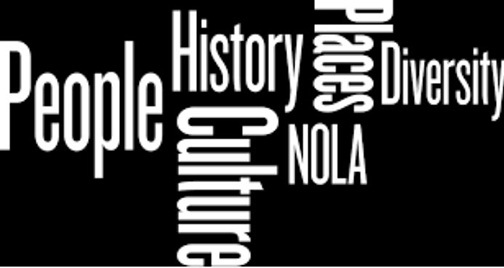 But while the neighborhoods along Broad Street are among the most vibrant, beautiful, and culturally resonant communities in the city, Broad Street doesn’t always live up to the beauty and pedestrian-friendliness of the Tremé, Faubourg St. John, and Mid-City. 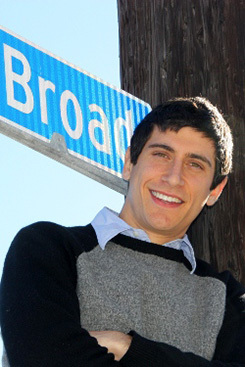 All of which is to say: Broad Community Connections has been working tirelessly for over six years to help Broad look the part of one of the great avenues in our fair city. We’ve been beautifying Broad and making it more of a pleasant corridor to which to drive, walk, bike, or take transit. Like the bicycle lanes on Broad above Orleans? We advocated for those, and are working to connect them to Tulane Avenue, and over the overpass to Washington and Napoleon. How about streetscape enhancement projects that bring landscaping, trees, and improvements to the pedestrian infrastructure along Broad? We’ve been advocating for the recently-completed project on Bayou Road for over five years, and are continuing to work with the city and surrounding property owners for the enhancement project at the Lafitte Greenway and on St. Louis Street. Did you notice that we planted over 40 trees on Bayou Road last year? We are currently working with the Regional Planning Commission to create an overall streetscape enhancement strategy for Broad that will bring improved pedestrian, cycling, transit, water management, and landscaping infrastructure and amenities to Broad Street. And who can forget about the Lafitte Greenway? Since we began, we’ve been working tirelessly with our partners at the Friends of Lafitte Corridor and the City of New Orleans to make sure the Greenway not only happens, but that it becomes the amenity for the surrounding communities, residents, and business owners that it should. As if that wasn’t enough, we are partnering with the Arts Council of New Orleans on a National Endowment for the Arts-funded project called BROAD+WATER to bring a water-based art installation to the Greenway at Broad Street. If you would like to continue to see a more beautiful Broad, please support BCC on GiveNOLA Day on Tuesday, May 5th! On Tuesday, Feb. 4, the Whole Foods Market Broad St. store will open at the corner of Broad and Bienville streets after an 8:15 a.m. bread breaking ceremony featuring a garden grant and new foundation announcements. The 25,000-square-foot store will open its doors offering a full range of high-quality natural and organic foods including a vast assortment of more than 330 locally-sourced offerings from some of Louisiana’s most highly-regarded community producers, more than 100 organic produce items, and hundreds of products exclusive to Whole Foods Market. The first 500 shoppers at the store will receive the new line of New Orleans reusable bags with Whole Foods Market product samples. Shoppers can also enjoy special store opening sales and music, as well as tips and tours with the Whole Foods Market healthy eating educators. Fosters healthy, diverse and vibrant communities by developing, operating and advocating for affordable, mixed-income housing, supportive services and employment opportunities for individuals, families, seniors and people with special needs. Seeks to cultivate and support historically disenfranchised organizations by making significant contributions to education, creative and culinary arts, and social justice. Empowers underserved youth through running, with an eight-month guided training program that emphasizes the long-term significance of empowerment, physical activity and mental resiliency in youth. Replacing southern live oak trees along Bayou St. John lost during hurricanes Katrina and Isaac. These trees have provided shade and improved the quality of life for neighborhood residents for centuries. Provides free, year-round music education to kids ages 9-14, with a mission to teach, support and empower the youth of New Orleans while preserving and promoting the city’s unique musical and cultural heritage. Once the building construction is complete, the community will be able to experience the full potential of the ReFresh project with tenant partners Liberty’s Kitchen, Tulane University’s Goldring Center for Culinary Medicine, Broad Community Connections, and FirstLine Schools, in addition to other collaborators around healthy eating and food access initiatives, including budget-friendly meal planning, store tours, health screenings and more. Whole Foods Market Broad St. Founded in 1980 in Austin, Texas, Whole Foods Market (wholefoodsmarket.com<http://www.wholefoodsmarket.com>, NASDAQ: WFM), is the leading natural and organic food retailer. As America’s first national certified organic grocer, Whole Foods Market was named “America’s Healthiest Grocery Store” by Health magazine. The company’s motto, “Whole Foods, Whole People, Whole Planet”(tm) captures its mission to ensure customer satisfaction and health, Team Member excellence and happiness, enhanced shareholder value, community support and environmental improvement. Thanks to the company’s more than 78,000 Team Members, Whole Foods Market has been ranked as one of the “100 Best Companies to Work For” in America by FORTUNE magazine for 15 consecutive years. In fiscal year 2013, the company had sales of $12.9 billion and currently has more than 360 stores in the United States, Canada and the United Kingdom. For store updates, community and event news, and new product information, follow us on Twitter @wfm_louisiana<http://twitter.com/WFM_Louisiana>, Facebook www.facebook.com/wholefoodsnola<http://www.facebook.com/wholefoodsnola> and www.facebook.com/wholefoodsbr<http://www.facebook.com/wholefoodsbr>, and Instagram @wholefoods_louisiana. 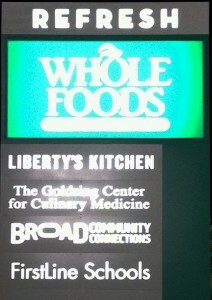 THE GRAND OPENING OF WHOLE FOODS MARKET BROAD STREET! 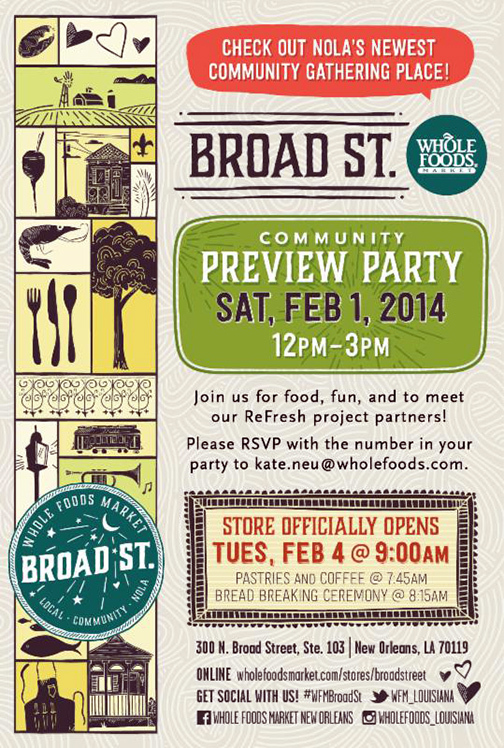 Join us on Tuesday, February 4 for the Bread-Breaking & Grand Opening at Whole Foods Market Broad Street starting at 8:15am!Be among the first 500 guests and receive a free NOLA Better Bag! Enjoy free coffee and pastries while you wait for doors to open at 9:00am, then music, special deals and more fun all day long! The ReFresh Project is an adaptive reuse of the former Schwegmann’s supermarket building at Broad and Bienville. The project that will include a new Whole Foods Market, Liberty’s Kitchen full service café and commercial kitchen, and The Goldring Center for Culinary Medicine at Tulane University. The fresh food access development has the dual purpose of anchoring economic development in the Broad Street commercial corridor and delivering much-needed, high-quality fresh foods and health-related programs to underserved communities along Broad Street. The development will also include office and community space, including the central office for FirstLine Schools and the offices of Broad Community Connections. Heard about the new ReFresh Project on Broad Street but curious about why it’s so fresh? Did you know that the ReFresh Project is more than a new Whole Foods Market? with coffee and refreshments at 7:45 a.m., opening ceremonies at 8:15 a.m. and doors opening at 9 a.m. The community will have the opportunity to attend a Preview Party Saturday, Feb. 1 from 12 to 3 p.m. with a sneak peek of the 25,000-square-foot store, ReFresh partners, samples from local and national suppliers, Whole Foods Market healthy eating educators, and more. The events are free and open to the community. The Whole Foods Market Broad St. store anchors the ReFresh Project, a 60,000-square-foot development that aims to stimulate growth in New Orleans’ Broad Street commercial corridor and to improve access to fresh, high-quality food and health-related programs in the community. More details, tenant profiles, and video are available in the online press kit at www.bit.ly/wholefoodsbroadst. For an opening week celebration that begins Feb. 4, the Whole Foods Market Broad St. store will donate one percent of the first five day’s net sales to non-profits whose missions serve children, seniors, personal and workforce development, empowerment, arts, social justice, beautification/environment, music, and culture. The Arabella Station and Veterans locations will also participate and donate their net sales. Providence Community Housing fosters healthy, diverse and vibrant communities by developing, operating and advocating for affordable, mixed-income housing, supportive services and employment opportunities for individuals, families, seniors and people with special needs. www.providencecommunityhousing.org. MotherShip Foundation’s Restore the Bayou Canopy campaign is a project that is replacing southern live oak trees along Bayou St. John lost during hurricanes Katrina and Isaac. These trees have provided shade and improved the quality of life for neighborhood residents for centuries. Founded in 1980 in Austin, Texas, Whole Foods Market (wholefoodsmarket.com http://www.wholefoodsmarket.com, NASDAQ: WFM), is the leading natural and organic food retailer. As America’s first national certified organic grocer, Whole Foods Market was named “America’s Healthiest Grocery Store” by Health magazine. The company’s motto, “Whole Foods, Whole People, Whole Planet”(tm) captures its mission to ensure customer satisfaction and health, Team Member excellence and happiness, enhanced shareholder value, community support and environmental improvement. Thanks to the company’s more than 78,000 Team Members, Whole Foods Market has been ranked as one of the “100 Best Companies to Work For” in America by FORTUNE magazine for 15 consecutive years. In fiscal year 2013, the company had sales of $12.9 billion and currently has more than 360 stores in the United States, Canada and the United Kingdom. Love that Chicken from McHardy's! 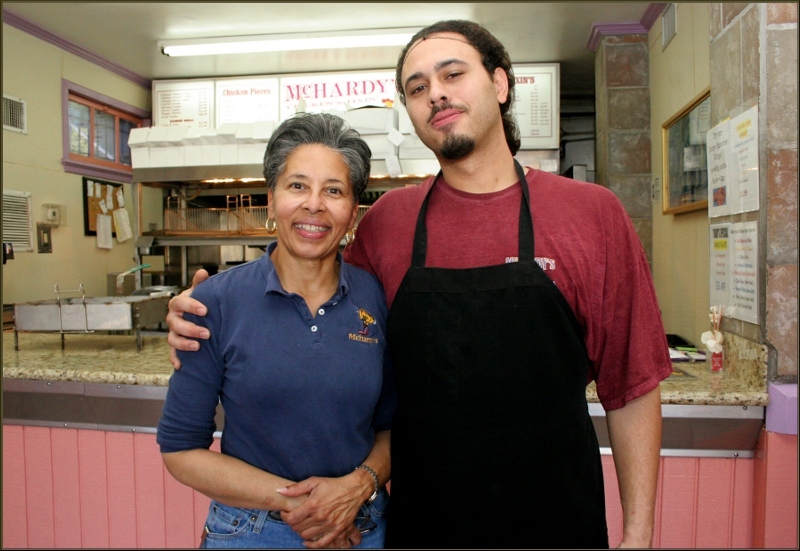 McHardy’s is open for breakfast Monday through Thursday from 6 a.m. until 9 a.m.
McHardy’s is open for chicken Monday through Thursday from 11 a.m. to 6:30 pm and on Friday and Saturday from 11 a.m. until 7:30 p.m.
On Sunday, McHardy’s is open from 11 a.m. until 3 p.m.
A locally-owned family business that serves homestyle fried chicken that is always fresh, hot and good. Our sides are french fries, rolls, peppers and beverages. We reopened after Katrina on Jan. 4, 2006. We live in the area and attend the nearby High School. We participate in Sheriff Marlin Gusman’s work-release program for inmates. We believe in our city and enjoy serving locals and visitors. We specialize in large orders also. We now have fresh fish on Fridays and homemade potato salad Thursday thru Saturday. Close to Jazz Fest!